Whether you need to make that presentation look perfect or you need to archive and organize your data, Discounted Office Supply.com has a wide selection of 3-ring binders, presentation binders, photo albums, data binders, and more. As the premier online retailer of janitorial and office supplies, we serve the continental United States from one of our 36 geographically located distribution warehouses. 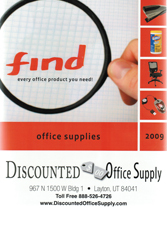 We pride ourselves on providing great pricing, a huge selection of office supplies and superior service. So whether you’re buying 3-ring binders, photo albums, presentation binders or post binders, you’ll get the best deal out there. Select a category below to browse our selection.